Welcome to our pick of the best portable SSDs of 2019. In this guide we look at the most dependable portable SSDs that combine speed, storage space and portability to ensure that you can safely keep all of your important files with you on your travels. The best portable SSD for your needs will come with bags of capacity, so you won't run out when storing your important files, such as photographs, while also making use of the inherent speed benefits of using solid state disks. So, when looking to buy the best portable SSD, you'll want to consider how much storage space it has. Around 500GB should be enough for many people, but if you want to store lots of large files, such as uncompressed videos, photos or music, then you should consider 1TB or higher of storage space. You'll also want to consider what type of connection the portable SSD has. Older connections, such as USB 2.0, will cause a bottleneck, as the connection cannot transfer files as fast as the SSD can read and write. The best portable SSDs, then, will come with a more modern connection for faster SSDs. At least USB 3.1, or the newer USB Type-C connection. Of course, you'll need to make sure that your laptop or computer also supports these connections. So, read on to find out what our picks are of the best portable SSDs money can buy in 2019. Samsung is a company that has made some brilliant portable SSDs, and you'll see a number of its devices on this list, however the Samsung Portable SSD T5 is our pick of the best portable SSD of 2018. It builds on the brilliant design and performance of its predecessor, the Samsung T3 SSD (also on this best portable SSD list), but brings it up to date with an incredibly fast USB Type-C connection that ekes out every last drop of performance from the solid state drive inside. Of course, it's also backwards compatible with USB 3.0 and USB 2.0 if your PC doesn't have USB Type-C. It's expensive, but it's well worth the cash. Seagate is a well-known brand when it comes to storage, and it's brought its impressive experience to the portable SSD market with the brilliant Seagate Fast SSD. This is an impressively slim external SSD, at only 9mm thick with a footprint of 94 x 79mm. Best of all, it's affordable – with prices likely to drop – and it’s an excellent performer, relatively small, plus it has a nice design and a three-year warranty. Well worth considering if you're looking for a the best portable SSD for a low price. If you want speed above all else, and money is (almost) no object, than the Samsung X5 Portable SSD is the best portable SSD for you. It comes with a Thunderbolt 3 connection that takes full advantage of the super-fast speeds of the brilliant Samsung 970 Evo NVMe SSD that comes inside. However, that pure dedication to speed comes at some expense. First, there's the financial expense, as this is a pricey external SSD. It's also larger and bulkier than the Samsung T3 or Samsung T5, which are also on this list. The device is fairly heavy at 150g, triple the weight of the Samsung T5, and at 116 x 60 x 18mm, it can best be described as portable rather than miniature. However, when it comes to performance, the Samsung X5 Portable SSD is definitely the portable SSD to go for. The Samsung Portable SSD T5 is one of the best performing portable SSDs money can buy, capable of reaching speeds up to 550 MB/sec, making the most of the USB 3.1 specification. It plugs directly into PCs and Macs with either a newer USB-C port or USB-A, is roughly the size of a matchbox and being a flash storage device, contains no moving parts, so can survive being dropped. 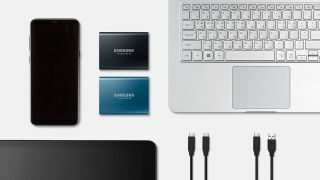 Samsung has made some of our favorite external hard drives over the years, and the Samsung Portable SSD T5 continues its proud tradition of making brilliantly-designed external drives that perform brilliantly. It's got loads of storage space – up to 2TB – but it is a bit on the expensive side. Storage giant Western Digital is no stranger when it comes to storage gear aimed specifically at pro photographers, and with the WD My Passport Wireless SSD it has created another brilliant device that photographers (or even regular users) will love. It joins WD's growing stable of wireless hard drives, which allow you to view and move files via a Wi-Fi connection, rather than with a cable, which is handy. However, over Wi-Fi, you're not utilising the full speed of the SSD. It also connects via USB 3.0, which offers very good speeds, but not quite as fast as USB Type-C or Thunderbolt. But the flexibility and durability of the WD My Passport Wireless SSD is certainly tempting, plus it comes with a built-in SD card reader, making it one of the best portable SSDs for photographers. The Adata SD700 will suit those looking for a rugged storage device that can provide ample capacity without costing too much. It offers good speeds, and it's IP68 rated, which means you can carry it around with you without worrying about it getting damaged. It comes in capacities up to 1TB, so you don't have to worry about missing out on storage space just because it uses an SSD. However, it doesn't come with the new USB Type-C connection, which means speeds aren't quite as fast as they could be.